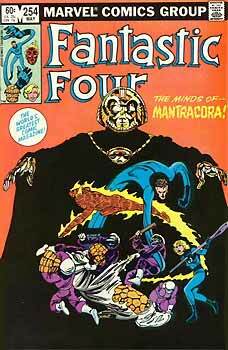 Fantastic Four #254 by John Byrne -- This was the comic that really cemented my life-long love of the medium and set me on the path I've been on for so many years. It had everything I needed to love a comic book exactly when and where I needed it. The Hitchhiker's Guide to the Galaxy by Douglas Adams -- It seemed almost 'mandatory' reading for teenage geeks, especially since the books were still relatively new back in the day. But it really did a lot to inform my senses of humor and language in particular, and more generally it provided guidelines for just being able to look at and redefine an object's purpose in an almost existentialist manner. World Book Encyclopedia (some early 1970s edition) -- My folks bought a set of encyclopedias soon after I was born, and they (the books, not my parents) had become somewhat dated by the time I was able to start reading and appreciating them. But I did actually read through them frequently and would regularly just pick up a volume to look up overviews of subjects that struck my fancy. You know how you might have a question that suddenly strikes you, so you pop over to Wikipedia to look it up? I was doing that by the 1980s with these books. 1984 by George Orwell -- I think I was a cynic well before I understood what the word meant. But when I first read Orwell's Animal Farm, I think I was a little too young to fully grasp the real meaning behind what he was saying. By the time I read 1984 a few years later, though, it hit me like a ton of bricks. It can read as an extremist's sophomoric attempt to predict the future, but I think some of the sweeping and broadly painted metaphors mask the subtlety of what Orwell was trying to say. Just like Make Room! Make Room! (the novel on which Soylent Green is based) is NOT about cannibalism, 1984 is NOT about Big Brother. Understanding Comics by Scott McCloud -- This was a book that I could not put down. It was a powerful statement about the possibilities of comics as a medium, and really opened my eyes as to how much more was available than the superhero fare I had been primarily reading before then. Story Number 1 through Story Number 4 by Eugene Ionesco -- I've mentioned these before as influential. They were children's books that were just surreal. My folks were big on making sure their kids were exposed to a wide range of ideas and world-views, and these books certainly qualified! These books were absolutely mind-bending in the best way possible. Comic Book Fanthropology by Sean Kleefeld -- This is, of course, the book that I wrote. It definitely didn't have the same type of influence that everything else on this list has, but it was very significant in a unique way. The experience of sitting down and writing an honest-to-goodness book, as opposed to a bunch of unconnected blog posts or magazine articles, was quite a powerful way to force me to think about narrative structure and parallel themes and all the other literary tropes that I've never really put into practice myself. I was able to push myself in ways that I never had before. Arrow to the Sun by Gerald McDermott -- This is a children's book based on an old Pueblo tale. It wasn't the story that stuck with me, though, but the visuals. The book has a very strongly designed look, and I've kept a copy as inspiration in my life as a graphic designer. Some of the projects I've done over the years were very deliberately and directly modeled off McDermott's art style, and they remain some of my favorite pieces. Interesting to note, too, that I only just now noticed some of the similarities between the art in Arrow and the cover to FF #254. Future Shock by Alvin Toffler -- This is actually a recent entry. I happened to start reading this during my divorce and, despite that it had been written almost four decades earlier, it still came across as very current and still forward-thinking. It had a fascinating way of looking at society, which I found strangely comforting during an emotionally difficult time. So, there you go. Ten books that helped shape the person that is Sean Kleefeld. After writing this list out, I think it really says a surprising amount about who I am and how I look at things. So what books had an impact on you?